I have this folder called “scraps” – that’s where I put all the random pieces, paragraphs, phrases and sentences that do not string together or fit with the scheme or story, but clearly symbolise sprouts of ideas that have germinated in my mind. They delight me with their appearance or occurrence, and it’s sad I can’t use them instantly. As usual, prudence prevails, even in writing. I put these words away. Every time I am stuck for ideas, analogies, thoughts, metaphors and all those ornaments and baubles that come to a writer’s aid, I rummage through this folder. More often than not, I find something that’s so totally worth the transplanting and nurturing into a seedling. Look what I discovered in the scraps - in the spoor of sprouts to make my fifth contribution to my friend Preeti Deo's Ruchira Giveaway Event and join in her fight against plagiarism! A writing plan, circa April 2012, the early days of writing – er- well, the before and after life of the recipes, delighting many readers, while trying the patience and tolerance of many more others…. Did you know fenugreek is used to artificially flavour maple syrup? Sprouted methi seeds are very tasty, piquantly bitter and very nutritious. To sprout methi seeds, soak seeds in water and when fully soaked, drain and wrap into a bundle in a muslin cloth for a day or two. You may need to moisten the cloth a few times. These seeds sprout easily, even the very old methi seeds I had soaked surprisingly sprouted very well - amazing Mother Nature! Used some while pressure cooking dal and then made the dal with chopped cauliflower parattas, onions, tomatoes and lots of garlic. Also added some sprouted methi to the dosa batter! A good way to finish the old stock of methi – and sprouting a new recipe. The whole house was filled with the aroma of methi cooking. My girls returning home as the pulao was cooking, reported the aroma had wafted down till outside the front door - love this way to welcome them home after a hard day. In a handi or a pot heat the oil. Add the cumin, shajeera, cinnamon and cloves. When they splutter add the chillies and then the onions. Sauté the onions a bit and add the ginger-garlic paste. Add the sprouted methi and peanuts and sauté well for a few minutes. Add the rest of the vegetables and after a few seconds add the drained soaked rice. Toast the rice in the mixture till all grains and vegetables are coated in the mixture. Add 4 cups of boiling water first and salt to taste. Add lemon juice. Let it boil for about 5 minutes. When the water starts to reduce check how much more water is required and add accordingly. Use boiling water. (When rice is soaked for 30 minutes, it needs less water to cook). Cover and cook on low heat for a few more minutes and then dot the surface of the rice with the ghee. Switch off the heat when almost done and let it rest covered for 10 minutes. The rice will cook perfectly with the latent heat. Fluff the rice with a fork and serve hot with a raita or plain dahi, papad and pickle. This pulao is a meal in itself. I am a fan of fenugreek seeds. I do know the health benefits too. 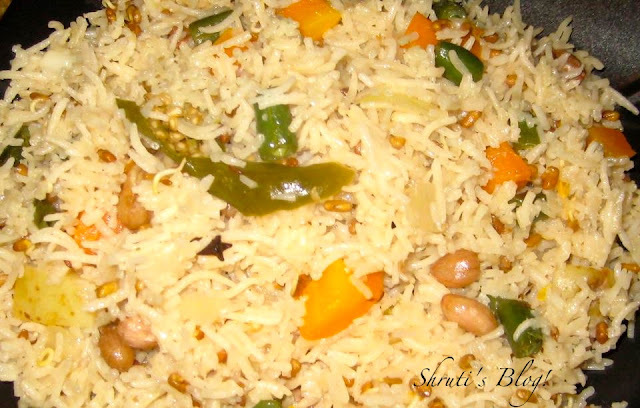 Eager to try this pulao. Thanks for the recipe Shruti.